Few years back we have started sending "Quote of the Day" email news letter for the people who are interested to receive Motivational Quotes in their email. I used php's mail() function for sending these emails using cron job. I followed all the required things for running the News Letter. i-e The News Letter mail will be sent to only the people who confirmed/verified their email id. And, the "Quote of the Day" mails used to have the "unsubscribe" link. I came to know that the mails were getting delivered to spam folder for the Gmail users, even though I followed all the best practices for sending News Letter email. Most importantly, confirmation/verification emails were also delivered to spam folder. So, lot of people couldn't verify/confirm their email. I tried various things to fix this issue. I added many header values suggested by many discussion forums, and I tried with PHPmailer also. But nothing helped me to solve this issue. So, finally I decided to use the third-party News Letter Service "MailChimp" which allows upto 2000 subscribers for FREE. But it is having some shortcomings. Previously, the "Quote of the Day" mail used to be composed automatically using the Quotes and Images stored in our website. I need not do anything to send the Quotes News Letter. But Now I have to manually create the News Letter Campaign content in MailChimp. Anyway, it is having easy-to-use interface. But I am not sure whether I will be doing it daily. And, the MailChimp will be allowing only 12,000 mails per month in the Free Plan. So, I will be reducing the Mailing Frequency. i-e I may not be sending the "Quote of the Day" mail daily in future. And, I will be removing the inactive subscribers. Visit my Amazon Influencer Page to see my Recommended Products and the Latest Deals and Offers Provided by Amazon. I have already added many products into this page. Daily,I am spending significant time to update this list to include the latest Deals and Offers provided by Amazon, and to remove the outdated products. I am adding the products only after doing lot of analysis by going through the Reviews and considering many other factors. Anyway, do your own research before buying the products mentioned in my Amazon Influencer page. To make use of the Deals/Offers/Discounts provided by Amazon effectively, bookmark my Amazon influencer page and visit it daily to see the latest offers. I believe this page can help you to save significant Money. And, inform me (rajamanickam.a@gmail.com) if you have any suggestions to make this list more effective. And, let me know if you know any alternate/similar product which is better than the listed product, in terms of Price, Quality, Availability, Delivery and Packing. Apart from my Amazon Influencer Page, you can check the Gold Box Deals provided by Amazon to get the products at Discounted Price. In the Year 2009, i-e around 9 Years back, I joined Amazon's Affiliate Program known as Amazon Associates. I added the Affiliate links, Banners, and Widgets in few of our Websites. 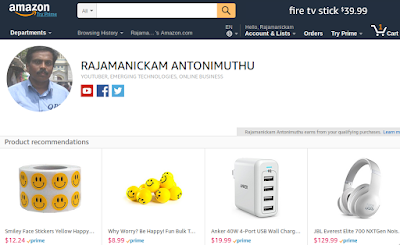 Even I created Amazon's aStore also. And, I received the first payment as Amazon Gift Card. But, later on I stopped focusing on Amazon Affiliate program, as my Google AdSense earning was much better than the Amazon Associate/Affiliate program. And, I had to spend lot of time in our Software Development related activities. I came to know that many people are making higher earning by adding affiliate links in addition to Google AdSense. But I hesitated to do this, because of 4 reasons. One is, I expect/assume drop in adsense revenue due to Amazon affiliate links; Second, I don't want to spend much time in adding affiliate links; Third, the difficulties involved in receiving payment from Amazon comparing to Google Adsense which will directly deposit money in my bank account in India. But Amazon used to send me the check payment for my Book Royalties. En-cashing the Amazon check used to take significant time and effort from my side. And, the Amazon.com affiliate program won't work for India users, we need to join Amazon.in affiliates program separately and we have to share the appropriate link according to the Country of the visitor. So, I avoided spending time for adding affiliate links in our websites and YouTube Channel. Now I have decided to spend my Time and Energy to earn Money from Amazon Associates program. Let me tell the reason why I made this decision. Few Months back, I had published a Kindle Book with title "How to Earn from YouTube Videos? : My Experience with YouTube". But it didn't make any sales. Few weeks back, I updated this Book content and published Paperback version also. And, I decided to promote this Book, as I thought it will be useful for the new YouTubers. So, I spent significant money for running paid campaigns for promoting this Book. I tried Facebook Ads, Reddit ads, GoodReads GiveAway, LinkedIn Ads and Amazon AMS ads. But it didn't make any sales. And, I got reviews/advice from KDP Forums and GoodReads that it is difficult to sell my Book due to various reasons like, low number of pages, Spell mistakes & Grammar mistakes, poor cover image, and the availability of best similar Books. Personally I feel my Book will be useful for the new YouTubers irrespective of these shortcomings. Anyway, I don't want to waste my Time and Money in promoting this Book which is not making any sales even after spending significant amount of Money for the promotion activities. So, I stopped/reduced all the promotion activities for the Book. This Book promotion activities made me to think about doing the Amazon Affiliate promotion again. Since I was spending significant amount of Money for Book promotion, I thought of earning Affiliate commission in addition to the Royalty payment for selling my own Book. By going through various Forums and Discussions, I came to know that this practice is allowed by Amazon and many Authors are doing it. And, payment related issue also got solved as Amazon started supporting Payoneer. So, I decided to focus on Amazon Affiliates/Associates again, at least for my Book promotion. Though I stopped the Book promotion, I decided to continue the Amazon Affiliate promotion activities. Since our YouTube Channel is getting significant number of traffic, my efforts won't go waste this time. Anyway, I am going to do it in limited ways only. I am not going to target all the people. As of now, I plan to use only the Amazon.com, that means I will use it for U.S traffic only, and will do it without affecting AdSense much, i-e I will include the Amazon Affiliate links in few places only. I started including the Affiliate links in few pages/videos. And, added Amazon's native shopping ads also in few pages. And, I came to know about Amazon's Influencer program. I just applied for it and it got approved instantly to give me this vanity URL in Amazon. I added few products including my Books. And, I am planning to add more products and Deals/Offers daily. I am exploring various Products and going through Reviews and Price/Deals details so that I recommend best products. Suggest me if you know any better products to be included in this page. 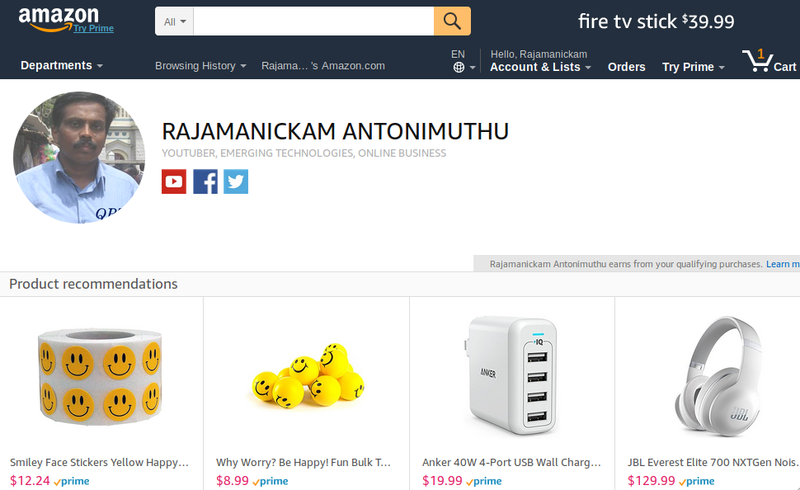 And, if you are Amazon Seller, let me know if you run any Deal/Offer/Discount for your product on Amazon, I will include it in this page if it is suitable for my audience. I am planning to make it as a place for my Readers/Viewers to check daily to find best Offers for the best Products. So, you can bookmark my Amazon Influencer Page, and share it with your Friends who may be interested in it. Regarding my Book, generally I believe in Never Give Up attitude. So, I will start promoting it again later after improving it further, mostly, after including new chapter about earning money from Amazon Affiliate Program based on my experiences that I am going to get in the coming days. I am running my YouTube Channel "QualityPointTech" (QPT) for more than 8 years. Apart from running YouTube Channel, I have tried various other things including Software Development, doing freelance work, running Websites, writing/selling Books, etc. But I feel very comfortable in running my YouTube Channel, and I am earning significant revenue from it every month. Anyway, I am not running my channel in perfect ways. I did lot of mistakes and corrected some of the mistakes and working on to address remaining mistakes. So, I thought sharing my experience with others may help them little bit to succeed in their journey of earning money online without making the same mistakes. And therefore I have published a Book "How to Earn from YouTube Videos? : My Experience with YouTube "
To create a Buzz about this Book, I am selling it with very low price now. I may increase the price later. So, if you are interested to buy this book you can use this opportunity now. And, it is available in "Kindle Unlimited". So KU Subscribers can read it for Free. Read below description of this Book. This book is NOT for telling any secret ways for earning money from YouTube, and it is NOT going to give any tutorial about YouTube. It is just for sharing my understanding and experience with YouTube by running my YouTube Channel "QualityPointTech". Find below the Topics covered in this Book. Why I Chose YouTube for Earning Money? Are People really making Money from their YouTube Channels? What is YouTube Partner Program (YPP)? How do I monetize my YouTube channel using Google AdSense? How can my videos make Money? One of my Videos is getting many Dislikes. Will these Dislikes affect the search position or any other organic traffic? Apart from using YouTube Analytics, can I use the Google Analytics to know more details about the traffic to my YouTube Channel? How to promote my YouTube Videos using Google Adwords? What is YouTube Red? What do people get for joining? Will my content be available with YouTube Red? Do I need to pay to join YouTube Red to keep my content on YouTube? I'm a creator based outside of the U.S., how will YouTube Red impact my content? Should I make longer videos to get higher watch time? Where can I view my YouTube earnings? What is Copyright strike ? Does Google AdSense provide official payment documents? What is Address (PIN) verification ? What is Multi-Channel Network (MCN) ? What are End Screens and Cards? What does the Yellow Dollar Sign mean on YouTube? What are the best practices for adding Thumbnails for the Videos? Can I replace a video in my YouTube Channel? Can I make changes to uploaded videos? What are the best practices for metadata? What is the importance of adding subtitles & closed captions (CC)? How to do Live Streaming using YouTube? I am NOT a tech-savvy person, but good at Music/Photography/Dance/Arts/Teaching/Gaming/Comedy/etc. All these Terms are confusing me. Whether I need know/do all these things to Earn Money from YouTube? You can buy this Book How to Earn from YouTube Videos? : My Experience with YouTube from Amazon. It is available in both Kindle version and Paperback version. Once after reading this Book, please share your review comments. You can contact me for any questions related to running your YouTube Channel. I may not be able to help you with best answer, but I am sure that I can definitely share my experience with you to help you go in the right direction. If you want be successful in your YouTube Career, you should focus on your core talent/skills to make people Happy either Directly (e.g Dance / Comedy) or Indirectly (e.g Tutorials, Education videos, LifeHacks). That is the very important thing apart from preparing the Interest List as specified in the Book. Once you start uploading useful videos, you have to promote it at relevant Social Media sites. You should do it to your target audience only. Don't share your video with people who may not be interested in your video. If you do so, your watch time will be affected heavily. Watch Time is the important parameter for getting views organically(Search, Suggestion, Browse) from YouTube. Choosing trending topics will be helpful to get views quickly. But do it for the topics that are relevant to your channel. As explained in the Book, not having quality mic severely affected my Channel. So focus on setting up the things required for your channel properly. Never tempted to copy anyone's video. Do YouTube Live frequently. Check your Analytics regularly. Initially focus on giving valuable content than getting views or earning Money. Cross promote your videos using Cards and End Screens. And remember to set your meta data (Title, Description, Thumbnail image) properly without violating YouTube's policies. All these things specified in the Book are not much helpful unless you have enough motivation to set proper Goal for your Channel growth, and putting efforts on daily basis to move towards your Goal steadily irrespective of any difficulties you may face. Since I am running our Motivational website TheQuotes.Net for many years, I could understand the power of positive thoughts for achieving our Goals. So, always stay Positive. All the Best!!! If you are interested to know the latest news about Emerging Technologies (e.g 3D Printing, Robotics, Drones, Graphene, Nano Technology, Artificial Intelligence (AI)/Machine Learning, Gene Editing, Desalination Techniques,Virtual Reality, Wearables, New kinds of Batteries, Driver-less Cars, Solar Power Improvements, Quantum Computing, Brain–computer interface, etc), then remember to Subscribe to our YouTube Channel "QualityPointTech".